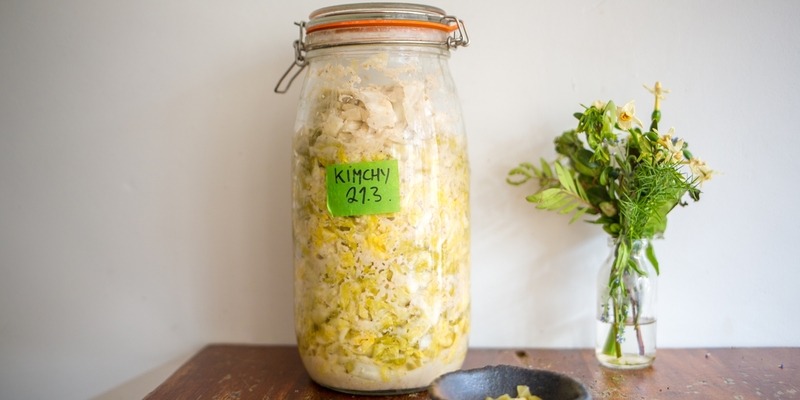 Making fermented food at home can sound a bit worrying – after all, it goes against our intuitions to take fresh ingredients, cover them in salt and leave them out of the fridge for days or weeks at a time. But it’s actually a very safe, simple way to create intense flavours which can then be incorporated into incredible recipes. This collection of fermentation recipes will get you well on your way to making healthy, delicious ferments and offer up some inspiration on how to use them in your cooking. Get started with kimchi – choose between the classic Korean Cabbage kimchi or one made with barley and black pepper. There’s also sauerkraut and miso to make from scratch. For actual dishes, you can’t go wrong with Anna Hansen’s Lamb neck with fennel kimchi, or Pollyanna Coupland’s Mushroom and chestnut pâté with tarragon and fermented cranberries. And for a dip with a difference, try Joey O’Hare’s Fermented tomato salsa. When preserving any food, it’s imperative to make sure your jars and equipment is all squeaky-clean and sterile before using. Be sure to stick to the exact ratios of salt listed as well – too much or too little will have a profound effect on the fermentation process.